Alongside Riikka-Piikka's boutique there is a voluntary Knitting Cafe that regroups at least every other week. The Knitting Cafe is open for everyone and there is no admission or other hidden fees. 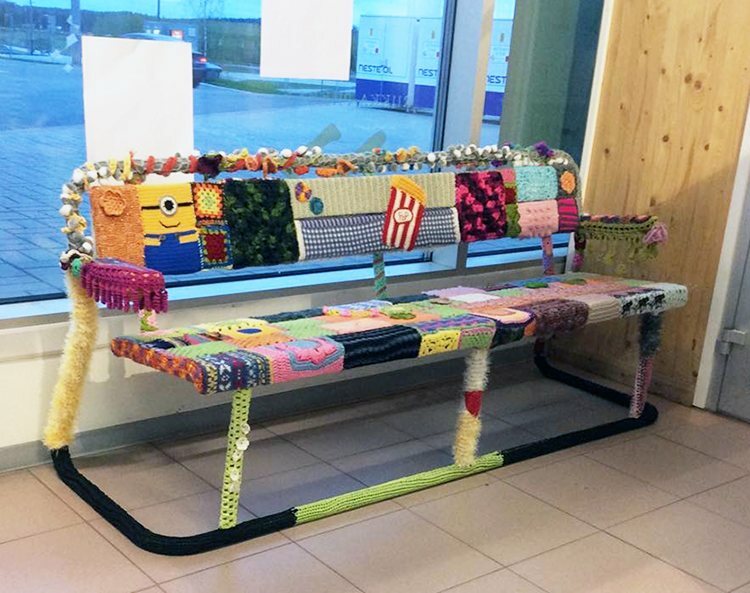 We usually start knitting every other wednesday from 6 till 8 pm and we meet at the corner table of Jari-Pekka's service stations. The Knitting Cafe crew has been meeting for the past 4 years, people attending as it fits to their schedule. The Thriving force has been a relax and happy attitude, free exchange of ideas and advices as well as selfnurturing interest towards knitted graffitis. 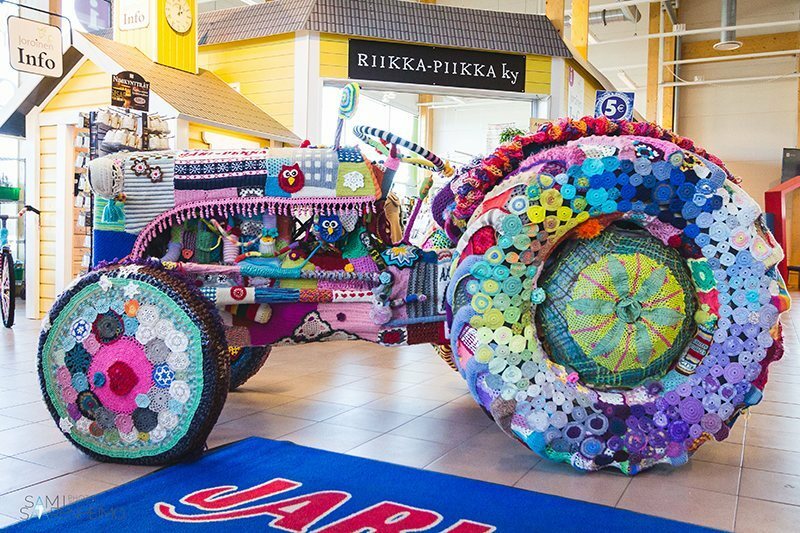 Our ”celeb” splash of knitted beauty and vibrant colours is the fully knitted, croscheted and laced 1952 Ferguson tractor. For this project the Kitting Cafe received bits and pieces from allover, seemed like everyone was onboard and in on the mission. Projects prior to the Ferguson were a park bench and an adult size bicycle. After all it was the bicycle that started it all. 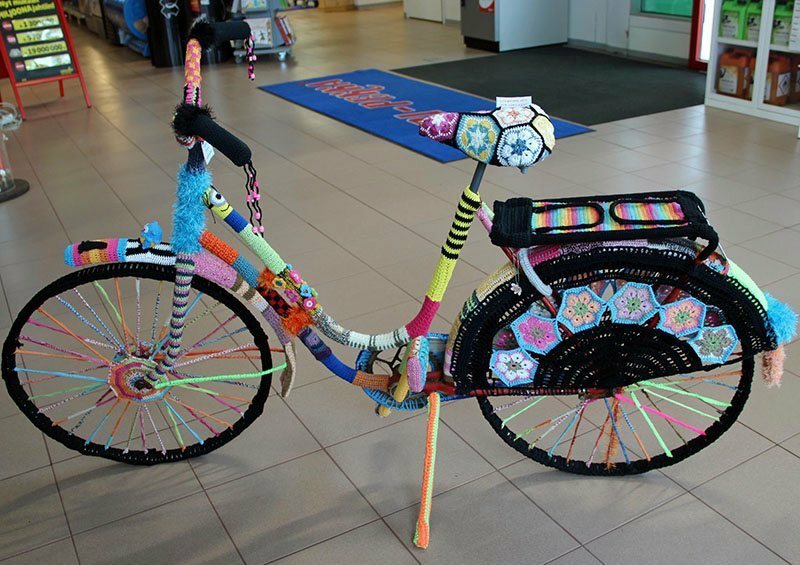 The bicycle was hand crafted by Soisalo Course of Crocheting. 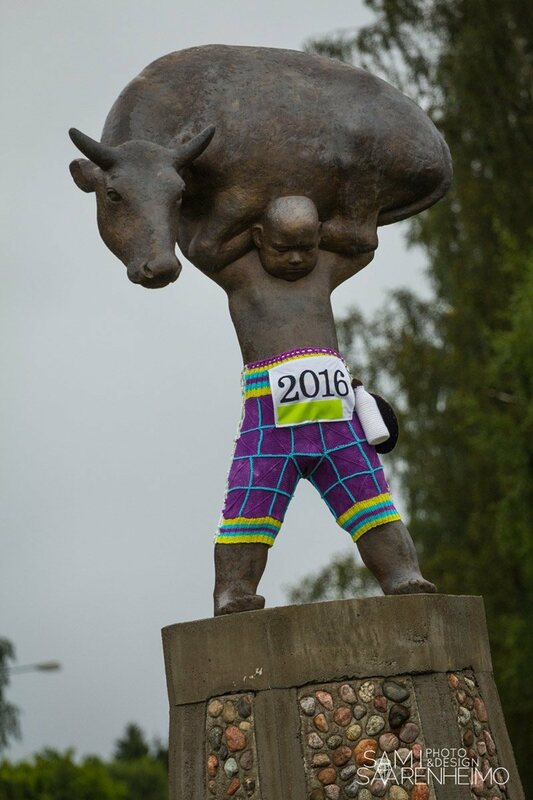 This same Crochet group were engulfed into knitting with The Knitting Cafe into other projects as well, as the local landmark statue, Härkäpoika aka the Boy with the Bull, and giving it the proper outfit to celebrate a local Finn Triathlon race in 2016. 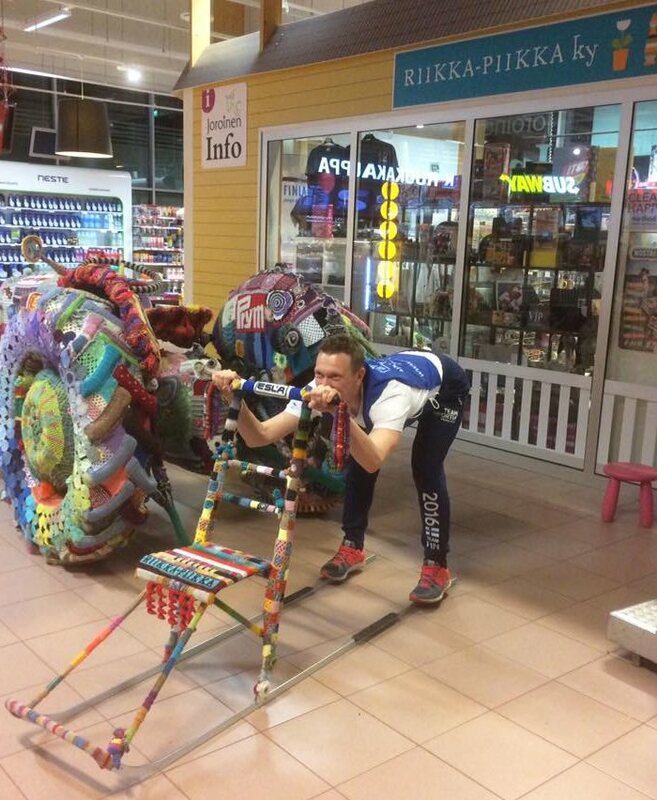 The Knitting Cafe´s newest adventure is a racing suit for Markku Levänen, the current World Champion-title holder in kicksleigh and only too well does it celebrate Finland´s 100th anniversary. Markku also got a matching knitted helmet cover to finish up his knitted racing suit. And the helmet is surely needed as he plunges himself down the side of a Norwegian fjord in very low slung style! 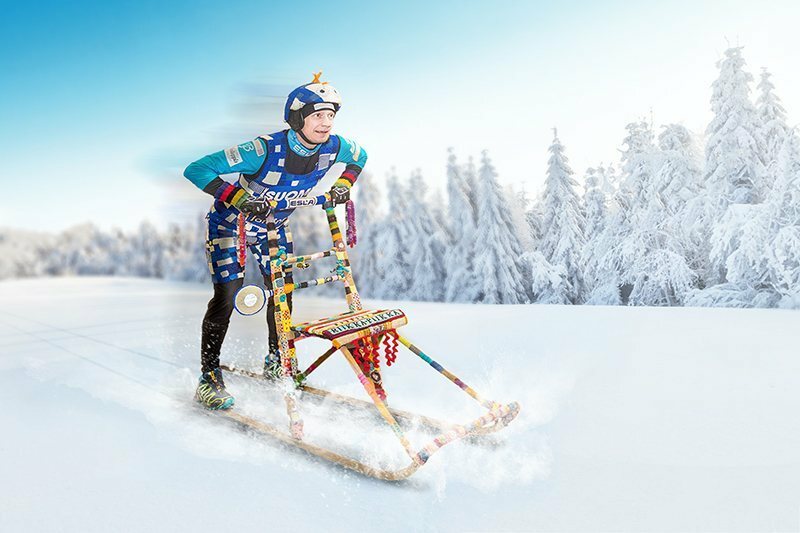 The beautified traditional Esla sled will be attending the 2017 Multia race when the hilarious crew from Riikka-Piikka´s Knitting Cafe is racing in relay competition. Here in the picture Markku is showing his most famous low slung downhill style. For more information, by clicking this link you can visit Markku´s very own site that lets You in on the kick sledding Markku`s homepage . The wonderful pictures were taken and edited by our very own local fotographer Sami Saarenheimo and by clicking this link You can visit his website for more info Sami Saarenheimo.net . You are more than welcome to come and meet us and feast you eyes on the incredibly beautiful and colourful works at Riikka-Piikka, Joroinen, Finland. Email us and we`ll send You the co-ordinates.